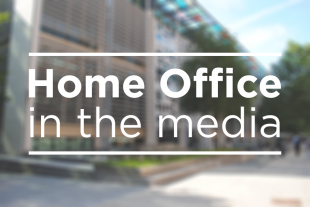 Today's Home Office stories include the extradition of Vijay Mallya and the launch of Safer Internet Day. The Guardian, Sun, Times, Telegraph, FT and City AM carry reporting on the decision by the Home Secretary to extradite the Indian businessman Vijay Mallya. The multi-millionaire, who owns Kingfisher beer and previously the Formula One team Force India, is wanted in India over allegations of a £1bn fraud, the Guardian reports. The 63-year-old has said he will appeal against the extradition. Previously he has dismissed allegations that he fled India leaving debts of £977million as “ludicrous”. He has said that he made an “unconditional” offer to pay what he owned in full last July, the Guardian reports. The FT reports that the Home Secretary’s extradition order comes after a UK court ruled in December that Mr Mallya had a case to answer on criminal charged linked to Kingfisher Airlines’ collapse in 2012. On 3 February the Secretary of State, having carefully considered all relevant matters, signed the order for Vijay Mallya’s extradition to India. Widespread coverage is given to the announcement of new laws to protect children from harmful content on social media platforms. The Telegraph’s splash leads with comments by Education Secretary Damian Hinds that children at a younger age need to be equipped to fend off potential paedophiles online. He said new compulsory relationship lessons will be introduced next year amid concern over the influence of social media. The Minister for Digital and Creative Industries, Margot James, will announce a compulsory code of conduct for online companies so they can be better policed, the Times, Sun, Guardian, Express and Independent report. The announcement will be made at a Safer Internet Day conference, with the Sun reporting that the move follows the death of teenager Molly Russell. As a parent, I know how important it is to keep children safe online. The internet can be a fantastic place to connect with people and share information, but it can also be exploited by criminals and abusers. It’s great to see more than 1,000 organisations come together on Safer Internet Day to promote the positive power of digital technology. The Government is committed to keeping children safe online. We are working closely with the technology industry to make the internet a safer and more responsible place.